What has changed in Turkey since the coup attempt? On July 15 2016, Turkey underwent an attempted coup against its government. The coup was prevented but repercussions are felt in every quarter of life. It paved the way for a number of radical changes and caused far-reaching social, economic and political consequences in Turkey. So what has changed in Turkey after the coup attempt? The failed coup provided the ruling government with the momentum to achieve the goal of changing the constitution and concentrating power. The constitutional reform, which aimed to strengthen the powers of Turkey’s president, was approved by a referendum, with 51 percent voting ‘yes’. Erdogan supporters argue that given Turkey’s history of coups – including the failed attempt on July 15 – a stronger executive is needed, while critics say the reform will entrench one man rule. Most of the changes will come into effect after the next presidential election in 2019. In the aftermath of the coup attempt Turkey has imposed a state of emergency, which still remain in place. The state of emergency allows President Erdogan to bypass parliament and suspend rights and freedoms. Latest government figures show authorities have fired 103,824 state employees and suspended 33,483 since July 15 last year. According to government data 50,546 “suspects” were in prison as of July 3. Judicial bodies processed the cases of 168,206 people linked to the coup attempt and arrest warrants had been issued for 8,000 others. Nearly 3,000 judges and prosecutors have been sacked. Almost all of them are in prison. Among jailed journalists were France’s Mathias Depardon and Italian journalist Gabriele del Grande, who were freed in June. The Turkish government blocked access to Wikipedia in April citing ‘threats to national security’. 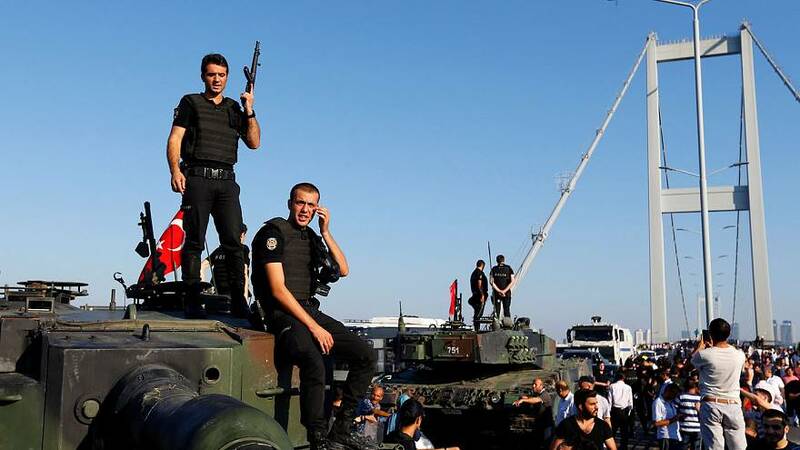 Turkey has shut military academies and put the armed forces under the command of the defence minister as part of a vast shake up of the military. A total number of 7,655 army officers, including 150 generals and admirals have been dismissed from their post since the coup, defence ministry sources indicate. In April the Parliamentary Assembly of the Council of Europe (PACE) voted to reopen a monitoring probe into Turkey over concerns about human rights. That means Turkey will be subject to frequent visits by human rights officials. The last time Turkey was put under such a monitoring process was in 1996. It was 2004 when Turkey was removed from the watchlist. Turkey is a member of the Council of Europe which is a separate body from the EU. The Europen Parliament (EP) voted by 471 to 37 to halt Turkey’s EU accession talks citing “disproportionate repressive measures”. The EP’s decision is symbolic. Amid highly-strained relations with several EU countries, Erdogan indicated they would seek to hold a referendum on whether to continue accession talks with the EU. 965 companies have been seized as part of the crackdown over the past year. The companies’ assets, which amount to nearly 11 billion dollars, according to deputy prime minister Nurettin Canikli, are now held within the Savings Deposit Insurance Fund. Owners of the companies are either in prison or abroad. Under emergency measures, more than 1,400 non-governmental organisations were closed in reaction to the attempted coup. In addition to that 934 schools, 109 dormitories, 15 universities, 35 hospitals and 19 trade unions were shut down with a decree issued by President Erdogan. Amnesty Turkey’s Director Idil Eser and nine others were detained on July 5th. Ratings agency Fitch downgraded Turkey’s sovereign debt to junk in January, cutting its last remaining investment grade. Other agencies Standard & Poors and Moody’s had also lowered their outlook for Turkey to “negative” from “stable” stressing concern about political insecurity after failed coup last year.